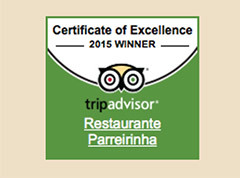 Restaurante Parreirinha (Pa-rey-ring-here), yes we do know it’s a tongue twister, has been called many different names by our regular customers, of which two are our favourites: Restaurante Parr and Restaurante Paraanha. The name Parreirinha originates from the words “little grapevine” and in the Restaurante courtyard there is still a little grapevine, that up until a few years ago was producing grapes. The building itself dates back to the early 50’s where it was locally known as the sixth Street Police Station. The courtyard area, which customers have come to love was the actual courtyard of the precinct. The kitchen was the charge once and the two side rooms were holding cells. These still have the original bars on the windows. The quaint spot in the heart of La Rochelle was established between two brother-in-laws in July 1975.